The aim of the study is to present the clockwise, modularized lymphadenectomy model of laparoscopic gastrectomy for gastric cancer patients, which is based on our clinical practice experience in laparoscopic gastric cancer surgery. 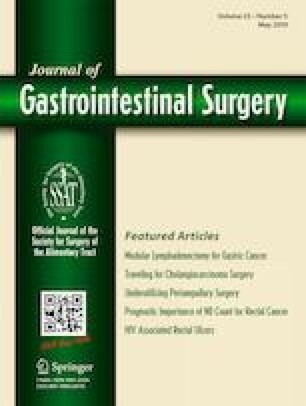 From Jan 2015 to July 2017, 116 patients who underwent laparoscopic gastrectomy were retrospectively collected and analyzed. According to the different resection models, patients were divided into two groups: traditional laparoscopic lymphadenectomy group (63 patients) and clockwise, modularized lymphadenectomy group (53 patients). Operation-related parameters were compared between the two groups. The clockwise, modularized lymphadenectomy group had less dissection time (119.8 ± 19.1 min vs. 135.3 ± 23.8 min, p < 0.001) and less intraoperative blood loss (81.7 ± 42.9 ml vs. 91.4 ± 28.7 ml, p = 0.016) compared with the traditional laparoscopic lymphadenectomy group. Meanwhile, the clockwise, modularized lymphadenectomy group had more numbers of examined lymph nodes (40.5 ± 14.3 vs. 33.9 ± 11.0, p = 0.007) than the traditional laparoscopic lymphadenectomy group. Besides, there was no statistically significant difference in the postoperative complication rates between the two groups. The clockwise, modularized lymphadenectomy group had shorter postoperative hospital stay than the traditional laparoscopic lymphadenectomy group (8.7 ± 3.2 days vs. 10.4 ± 3.9 days, respectively, p < 0.001). Through the adoption of the fixed sequence of lymphadenectomy, requirements and standard of lymphadenectomy of each lymph node station, and specific surgical skills for intraoperative exposure by the clockwise and modularized lymphadenectomy model, we can optimize and facilitate the laparoscopic gastric cancer surgery. Wei-Han Zhang and Kun Yang contributed equally to this work. The online version of this article ( https://doi.org/10.1007/s11605-018-4009-1) contains supplementary material, which is available to authorized users. The authors thank the substantial work of the Volunteer Team of Gastric Cancer Surgery (VOLTGA) based on the Multidisciplinary Team (MDT) of Gastrointestinal Tumors, West China Hospital, Sichuan University, China. 1) The National Natural Science Foundation of China (No. 81372344). 2) Sichuan Province Youth Science & Technology Innovative Research Team, No. 2015TD0009. 3) 1.3.5 Project for Disciplines of Excellence, West China Hospital, Sichuan University, No. ZY2017304. 4) Fund for Fostering Academic and Technical Leaders of Sichuan Province, No. 183-19. Wei-Han Zhang, Wei-Wei Wu, and Jian-Kun Hu edited the surgical video. All authors contributed to the writing of the manuscript and final approval.